What's the difference between seltzer, sparkling water, club soda and tonic water? At its most basic, seltzer is simply plain water that has had carbonation added to it. It does not contain added salt, so it is sodium-free. Seltzer may also be naturally or artificially flavored. True mineral water comes from a natural, unpolluted, underground source and contains small amounts of natural minerals, such as calcium, magnesium and sodium. The layers of rock that the water has flowed through impact the type and amount of minerals it contains. An 8-ounce glass may contain between 10 to 30 milligrams of sodium, depending on the origin and brand. The carbonation may be naturally occurring, or it may be added. Thanks to its trip through the mountains (usually in Europe), mineral water costs about twice as much as seltzer. Most commonly used as a mixer, club soda is a mix of carbonated water with sodium bicarbonate, sodium chloride and potassium sulfate, to enhance the flavor. It has 95 milligrams of sodium per 12 ounces, so stick to one serving a day to avoid sodium overload. This bar staple is a departure from the other waters in that it is sweetened. Along with sugar or high fructose corn syrup, tonic water also contains citric acid, sodium benzoate (as a preservative), quinine (a naturally occurring chemical) and natural flavors. Tonic water was created in 1858 in Britain, but wasn’t introduced to the United States until 1953 when Schweppes began bottling it. 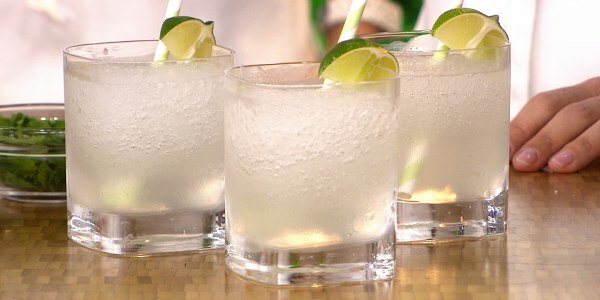 Quinine gives a bitter flavor to the beverage, which makes it pair well with lime and gin. However, quinine can interact with certain medications, such as blood thinners, statins and antacids. Check with your doctor if you’re not sure whether the medications you are on could cause any side effects if combined with quinine. Thanks to the fact that these bubbly waters (with the exception of tonic water) are calorie-free, they’re generally considered to be healthy beverage choices. But what about that study that showed that carbonated beverages make us hungrier? Well, if you dig a little into how the study was done, you'll find that soda — both regular and diet — was used, not plain sparkling water. Also, the study was done in rats and showed that fizzy drinks caused them to eat more and therefore gain more weight over a six month period. The weight gain was linked to a hormone called ghrelin. The researchers did repeat the study in 20 young men and found that their blood levels contained more ghrelin after consuming the soda than after drinking regular water or flat soda. It's definitely interesting, but one small study in rats with soda doesn't mean that your sparkling water habit will make you gain weight. Now, what about your chompers? Will they be destroyed by all that carbonation? You may have read that carbonated water can harm the enamel on your teeth. The concern is over the carbonic acid, which forms when carbon dioxide is dissolved in water. This acid can gradually weaken and destroy tooth enamel over time. The good news is carbonic acid is a weak acid, so a sparkling water, like Perrier or San Pellegrino, has a pH of about 5.5 compared to bottled still water, which has a neutral pH of 7. The issue really comes in when carbonated water is flavored with citric or other acids, making them more acidic and more harmful to your teeth. If you’re a sparkling water or seltzer junkie, don’t freak out. The best advice is to enjoy your fizzy beverage with meals and stick to plain water between meals for hydration. And here’s something to make you feel better — despite its acidity, sparkling water is still a better choice for your pearly whites than regular or diet soda. Frances Largeman-Roth, RDN, is a nutrition expert, writer, mom of 3 and best-selling author. Her books include Feed the Belly, The CarbLovers Diet and Eating in Color. Follow her @FrancesLRothRD and check out her website.